On Friday, Motorola made details and a release date official for their smartwatch, the Moto 360. At the time, they would only provide a specific launch date for the model with a leather band, noting that the all metal band/watch combo would not be available until later this Fall. Priced at $299 for the watch/band combo, or $79.99 for a stand-alone band that could be swapped in for a leather strap, many were interested in this version only. Without a specific date from Moto, most were wondering how much longer we would be waiting. Would we see the metal Moto 360 in a couple of weeks or would it be much closer to the first day of Winter? Verizon seems to think they will be ready to ship by November 11. Apologies for not sharing this earlier (been traveling for days), but Verizon posted this date as early as Saturday morning, maybe even Friday night. I think it’s pretty clear that they were given an estimate by Motorola out of the gate and are attempting to hold them to it. Keep in mind that Verizon is also listing 10/27 as a release date for the Moto 360 with a leather band, so November 11 could simply be the day that Big Red is allowed to sell it. We could see the metal version even earlier through Motorola, Best Buy or Google Play, the original batch of retailers. 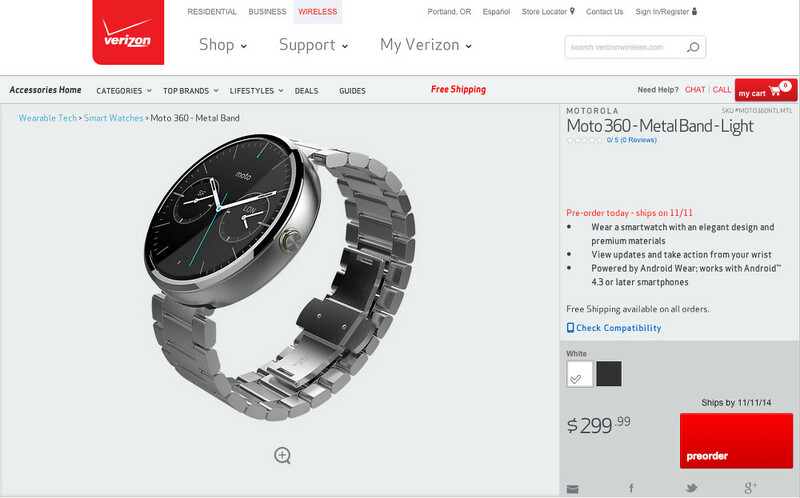 Update: Verizon has pulled their listing for the metal Moto 360. Whoops. Cheers Adam, George, and Jason!